This tasty pasta dish is a nice and simple midweek treat. 2. Boil the broccoli in a separate pot for 6 to 8 minutes, until tender. Drain and rinse under cold running water. 3. Pour the cream and crème fraîche into a large frying pan. Bring to the boil, then reduce the heat and simmer for a few minutes, until slightly reduced. 4. 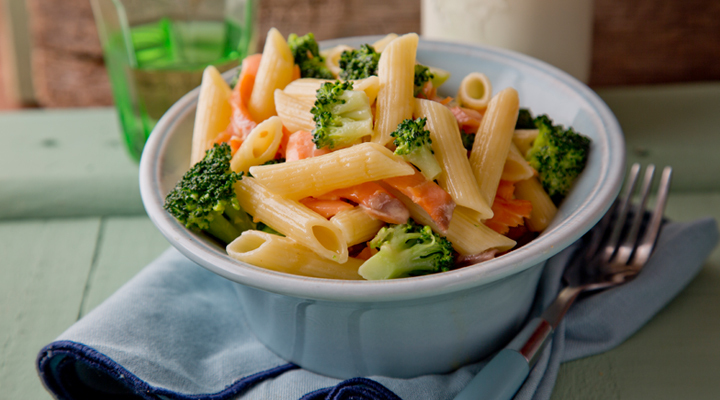 Mix the cooked pasta, broccoli and lemon juice into the frying pan with the reduced cream. Season with a pinch of salt and pepper and mix well, then fold in the sliced smoked salmon. Divide between four bowls and serve straight away. Tip: Instead of smoked salmon, you could use a good-quality tinned tuna.